Over the last few weeks I’ve been working on the Digital Britain Unconference series of events, that sprang from being on Twitter on the afternoon of 18 April 2009, towards the end of the Digital Britain Summit. Bill Thompson has explained what happened and how, much better than I could – here. The result of those Twitter conversations has led to – in less than three weeks – a group of people (all volunteers, most of whom have never met) from across the UK working together to organise over twelve unconferences to discuss Lord Carter’s Digital Britain Interim Report. This process experience in and of itself has been an amazing and at some point I’m planning to put together a case study of how we went about organising everything, the tools we used, what worked, what didn’t work – a guide for anyone should they wish to do something similar. The unconferences will be all done and dusted by 13 May – less than a month after it all began – when the process of collating and editing everyone’s reports will begin, so that we can produce one final document for consideration by the Digital Britain team. Suffice to say, all this has meant much contemplation about the future and how we’re in a huge process of change, in terms of how we think and operate as a country, how it affects infrastrucure, democracy, the economy, individual businesses and sectors, society, education, culture and how technologies sit amongst it all. Last night the London unconference happened at the ICA. There were over 50 people in attendance representing many digital/technology touch points – a lot of brains and a lot of experience in one room. Discussions ranged from an uploaders manifesto and ensuring wide inclusion to how to encourage a stronger culture of entrepreneurship. The findings and conclusions are in process of being written up by Tom de Grunwald with help from others. These are big, tough questions. Writing a report for Digital Britain that even begins to scrape the surface of some these issues is a challenge and my hope is that the unconference efforts help, not hinder this. 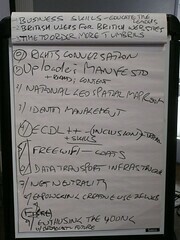 I think the unconferences have been brill, and it is raising awareness of the lack of infrastructure that is going to hinder digitalbritain in the future. Well done for getting them off the ground and bringing together some of the best forward thinking minds of the country. We must remember that the internet is there for the people of the world, not just for governments to use, and we must keep up with the times and not get behind other countries who are laying and lighting fibre. Even third world countries are seeing the ‘light’. We are still operating on an obsolete copper network and are tied to low bandwidth. I hope your final report has gathered evidence to urge government to light fibre to every home in the land, because this is the eNdGAme, futureproof digital britain. Anything else is a waste of time and money, a stopgap solution. Not just my humble opinion but the opinion of many who are limited with the current availability and quality of broadband and find they can’t do the things they want to do. Neither can we try out things, because the system can’t cope, and adsl market failure in rural areas is stifling innovation. More power to your elbow, keep rocking. chris. Thank you Kathryn for being the catalyst that made it all happen. Yes, we all contributed to the event. But there is a great deal of work both before and after these events to both prepare for and document the results of even the most ‘Un’ of events. Your inspiration is much appreciated. The tenor of your blog post is insightful and interesting. I suspect ‘catalyst’ is not the correct term!